Last month, the washer started to make a horrible grinding noise, and I knew it wasn’t worth costly repairs at its advanced age. It also smelled bad. Using my friends’ machines and detergents while I waited for my new machine to be delivered was enlightening. I learned that a top-loading, high-efficiency washer can be pretty deep; you might not be able to reach the clothes at the bottom unless you have a tall roommate. I also found myself missing the pedestals I bought for my front-loaders; they raise the height up about a foot and provide a storage drawer. My mom embraced dryer sheets in the 1970s, when they proved an easier way to soften and prevent wrinkles than adding liquid fabric softeners. So, I naturally tossed a dryer sheet into every load, except for towels, without giving it much thought. My friend Susan never uses dryer sheets or fabric softener, and she says she doesn’t miss it (although she does sometimes get the dreaded static cling). My friend Nancy uses dryer balls as a greener (and less expensive) choice, and I liked how fluffy they made my cotton loads. I’m planning to order some dryer balls and will limit my use of dryer sheets in the future. Mold is a dirty word to owners of front-loading high-efficiency washers. Manufacturers have struggled to figure out how to prevent these low-water machines from developing a musty, mildewy smell that can come from detergent residue or clothing fibers getting stuck inside its parts. My old machine had a bad odor, and by the time I started leaving the door ajar, it was too late to totally get rid of it. I figured someone must have come up with a solution to that since 2003, but my friend Susan’s five-year-old Kenmore front-loader had a slightly musty smell, too. The salesman who recommended my Maytag told me it’s still best to keep the door open when not in use and run the washer’s cleaning cycle once a month. The load of whites I did in Nancy’s Samsung high-efficiency top-loader were so bright, clean and fresh that they glowed when I took them out. I used her Mrs. Meyer’s Clean Day Laundry Detergent in lemon verbena and OxiClean White Revive brightener. Why was there such a difference? As the years go by, your washer probably will experience a marginal decrease in performance, and your clothes can start to look dingy, according to Melissa Maker, who started a cleaning service in Toronto in 2006 and has been writing for the blog Clean My Space since 2011. “It’s not something that you’d really notice, it happens gradually,” Maker says. 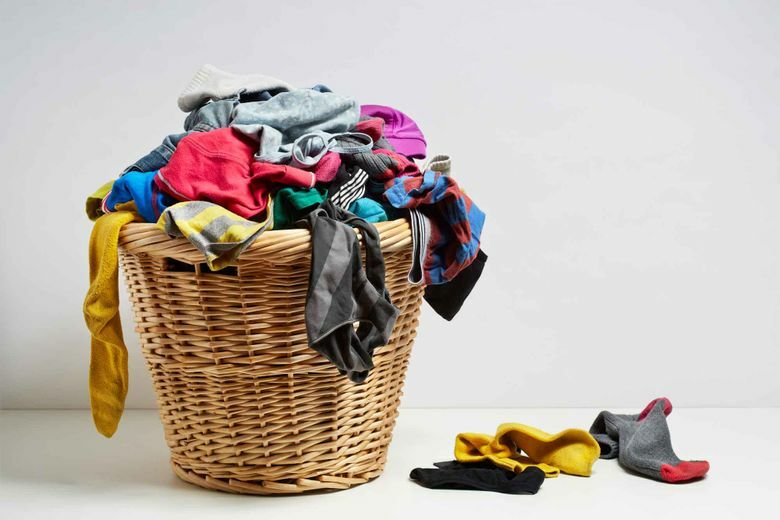 “When you washed your clothes in a newer machine with different products, it made you think, ‘What have I been missing all these years?’ ” Maker says adding a brightener to your detergent really makes a difference. I’m going to try that combo in my new washer. I periodically clean out the opening under the lint filter using a flexible dryer lint brush, a product Maker highly recommends and calls “a long mascara wand.” But I had never thoroughly checked out my dryer vent or had it professionally cleaned (even though I have written about the fire hazards of lint-clogged vents). Susan cleaned her vent about a year ago when her loads started taking much longer to dry because of decreased air flow; Maker says that’s the telltale sign you need to clean your duct, fast. Nancy does it once a year or so with a vacuum. These conversations persuaded me to get a $59 Groupon for a dryer vent cleaning. The pros told me my vent was only lightly coated with lint; they said that was probably because we remove the lint from the filter tray after every load. Maker says if you’re a handy person, you can clean it yourself, but if not, go with a pro.